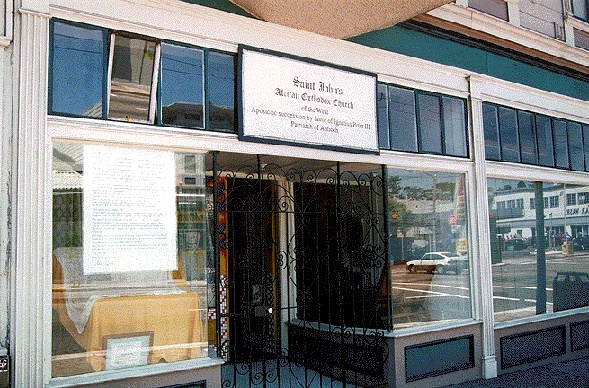 The John Coltrane Church, formerly known as the "One Mind Temple Evolutionary Transitional Church of Christ, St. John Coltrane Memorial Branch"; now called "St. John's African Orthodox Church, Jurisdiction of the West, Apostolic Succession by Favor of Ignatius Peter III, Patriarch of Antioch." When the saints go marching in, jazzman John Coltrane will be leading the procession, pouring out divine riffs like manna from his heavenly horn. That, at least, is the fervent belief of the folks who worship at the Coltrane Church. If you listen devoutly to Coltrane's "A Love Supreme", you may end up agreeing with them. San Francisco's African-American and Latino churches put on some mighty services, but none of them, in Dr. Weirde's opinion, comes close to this one. For great music, and sheer religious chutzpah, the Coltrane Church's Sunday worship can't be beat. The 20-by-40-foot room is usually jammed with smiling, swaying, deeply concentrating people of all ages, races and genders who have discovered Coltrane's '60's stuff captures the sound and color of creation. When the man picked up his sax, he didn't just make pretty sounds, he'd take a walk with God. The ever-growing throngs of worshippers seem to concur, and the colorful Coltrane icons that cover the walls beam down beatifically. Note: In early 2000 the Church moved because of a massive rent increase; they held services in temporary locations and are now on Fillmore.